Organic CBD oil ice cream might just be the modern day health and wellness answer to those who are overworked, tense and stressed out. At the very least. Next time your body needs soothing relief you can pull CBD oil ice cream out of the freezer instead of popping an Advil. It can be made at home in your kitchen using organic ingredients, an ice cream maker and 125 mg of CBD oil. Don’t have an ice cream maker? Not to worry! Here, we also explain how you can mix it by hand and freeze it in a pan. And no, CBD ice cream won’t get you stoned. For a more psychoactive experience, you’d need weed ice cream that’s THC potent. So enough with all the lollygagging – ready? 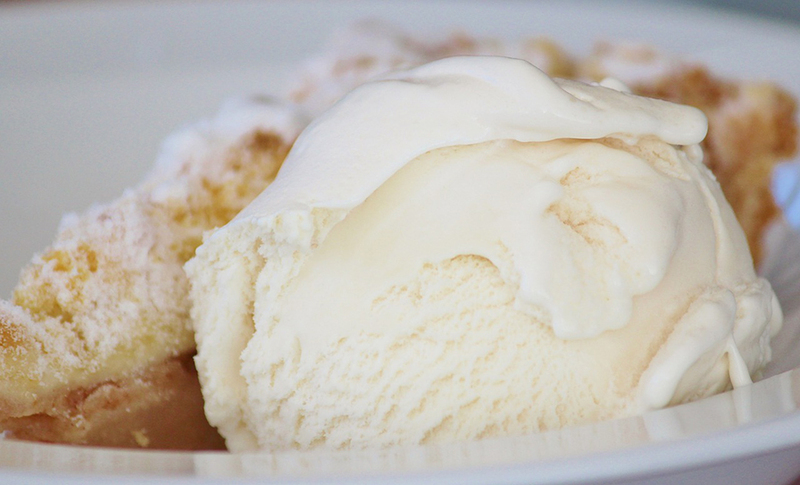 A teaspoon of vanilla extract is all it takes to create a basic vanilla ice cream which we’ve incorporated into this CBD recipe for you, but you can flavor this recipe with anything you like. As for dosage, start with a scoop the first time and see how it treats you! First off though, decide which method you want to go with. If you don’t have a home ice cream maker, you’ll have to be a little more patient. Pour cream, milk, sugar, vanilla extract and the CBD oil into saucepan. Simmer on the stovetop for 5 minutes and simmer on medium-low heat. Heat mixture until it is hot and a small ring of foam appears around the edge. When finished, remove the pot from heat. If you don’t have an ice cream maker, skip these steps until you reach the step labelled 2B. If you have a ice cream machine this is where your devices instructions take over. Add the mixture into the machine as directed. Next, add the bowl of ice cubes into the canister. If you want to add any other toppings in the mix before churning, now’s your chance (chocolate pieces are delicious with vanilla). Churn the mixture. Most ice cream makers suggest churning for 20-25 minutes. Right out of the ice cream maker your cannabis ice cream will have a soft serve consistency. Your weed ice cream is complete! Optional: You can cool your mixture in the fridge, leaving it to chill for minimum 2 hours. Or if you prefer more of a hard pack, parlor-style ice cream, scoop the mixture into a bowl, leaving a bit of room for expansion, put on a lid and freeze it overnight. And voila! Your CBD ice cream is done! If you’re mixing by hand, pour your ice cream mixture from the stove into a shallow pan, an inch-to-an-inch and a half deep (the ice cream, not the pan). You don’t need to add ice cubes if you’re not using an ice cream maker because you won’t be able to crush them. Put the pan in the freezer for 45 minutes. When you pull it out you’ll notice that it mildly froze in places. Use a whisk to thoroughly stir and distribute your mixture, breaking up any larger frozen pieces you encounter. Pop the tray back in the freezer and begin taking it out and stirring every half hour for about 2-3 hours. You’ll find it getting thicker and thicker each time. As it thickens feel free to use a hand mixer if you have one to get a better stir. When it’s done, you should have fully frozen, finished ice cream. You’ll know it’s finished when it clings to the pan and holds its shape. Transfer it to a tightly-sealing freezer container. We’re up to the best bit. It’s time to create and decorate your CBD Sunday. Scoop your weed ice cream into a tall glass and sprinkle with all your chosen toppings – cherries, marshmallows or caramel topping, to start. That’s it! Your CBD oil ice cream medicine is ready to store in your fridge for later use when you’re needing to relax or get some pain relief. This entry was posted in CBD Information, Consumption and tagged cbd ice cream.